All businesses operate a little differently from others. It’s no use denying it. Ultimately, however, they all share the same goals. To provide a service that delivers genuine quality to the end user. To the extent where the end user is more than happy to pay for said services. Simply put, it is what has always been referred to as a supply chain. However, while you may feel that your supply chain and flow is relatively simple, you won’t know how true that really is until you need to remap your business systems. If you’re in the process of restructuring, or auditing for efficiency, you may well struggle with knowing where to get started. That, essentially, is where the concept of a Critical Client Flow comes in. SYSTEMology® revolves around grasping an understanding of how each of your business systems and processes work. From the offset, we always advise taking advantage of a CCF. A CCF will not only allow you to look closer at what happens at each stage of your business’ typical chain and flow but will also enable you to make strategic, worthwhile changes. Ones which will impact positively upon your end product and experience. Our philosophy revolves around breaking down these processes and understanding what is most critical to you. Building and looking at a CCF is just the first step. In this article, we will explain what you can expect from a Critical Client Flow as part of your own SYSTEMology® journey. These are the mission-critical systems. So what is it? It’s a linear flow, and it’s how your prospects move through your business, prospects and then how they turn into clients. 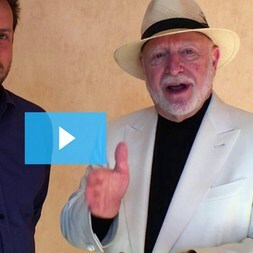 So what you need to do is, we need to first think about, what is the primary target audience? Who were you selling to? What are you selling and whom are you selling it to? We just have to get clear on who that is, and we’re just looking at doing the Critical Client Flow for that one stream in your business. Yes. I know you sell multiple different products. You’ve got multiple different clients and target markets, but we need to figure out one, and we document that really well. Pick a product that you make a great margin on that attracts easy and good clients to you, something that if you could scale that, your life would be easier. So we start there. Then we just think about the linear process Step 1, Step 2, Step 3. Step 1. How do you get your client’s attention? You might think attention could be search engine optimisation. It could be SEM; you might be running newspaper, magazines. You might be speaking; you could be running any number of things. How do people get attention? What do people advertise? Social media, Expos. Start to think about how you’re getting attention. The next step is how do you then get engagement? Someone becomes aware of you and your business and your offer? Is there a step in there where they’re not quite a buyer? They’re still in browsing mode. How do you then encourage them, offer them something free to be able to engage with you and stick around and learn more about you? Is it two free classes when they attend your gym? Is it a webinar? Is it a downloadable PDF? What is that engagement thing that you want them to take if they’re not quite ready to buy? Then some of them at some point hopefully will be ready to make an enquiry. How do people make an enquiry with you? Do they fill out a form, do they pick up to the phone, do they walk up to the store? How do they then engage with you? We’ve caught their attention. We’ve engaged them and then now they’re interested. Do you have some form of sales process? Some businesses, yes, some business not so much. If you’ve got an e-commerce store, you’re probably driving the person to your website, and you want them to hit Buy Now. If you’re selling a service, you might have a discovery session where you find out more about what they want. You create a proposal; you develop that. Then how do you onboard them once they’re ready to go? Yes, you’ve sold them. Now, how do you get them on and set the right expectations? We see this all the time. Working with Jamie and you’ll learn about Jamie’s business a little bit later as we go. One of the things that when we first started working together, we talked about is this idea that he would sell the client. He helps people apply for their visas for immigration. Once that work is done, there’s nothing much that Jamie’s team can do for the next six to eight weeks. So the client doesn’t necessarily know what’s going to happen and they don’t hear from Jamie. So having the right onboarding to set the expectations and set the correct timeline solves a whole lot of problems up front. Then there’s the delivery of the product or service. You actually have to do whatever it is, and then you get them to come back. 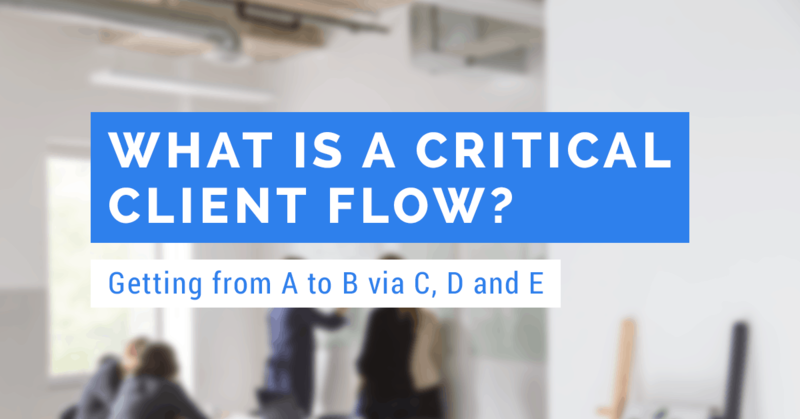 So the whole goal here is, all the way from attracting through the selling to onboarding, delivering and then getting them to come back, that is the CCF, the critical client flow. It seems relatively simple to get everything down step by step. However, to better understand the most critical aspects of each stage of your systems and what they aim to deliver, it is so important to understand what happens – and what can happen – from moment to moment. Some of us are so fixated on the big picture; we lose track of the smallest components. A CCF is designed to help map out and plan what you can and should expect at each stage of the chain. We all know that our client flows are all going to be a little more complicated than two-step plans. Creating a product and then selling it is the watered-down version. What happens in between? 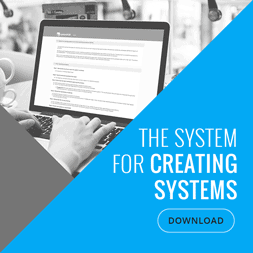 SYSTEMology® is designed to look at the nitty-gritty. It’s a program which helps to redefine sometimes cluttered and complex system in more digestible chunks. Our brains don’t necessarily work the way our systems do – which is why we sometimes have to rethink the way we understand things. The team here at SYSTEMology® would love to hear from you. Do you have any previous experience with a CCF model or similar? How has it helped to transform the way your systems operate? If this is your first time coming in contact with a critical flow, reach out to us, and we will be more than happy to discuss how SYSTEMology® philosophy could revolutionise the way you run your business.